This thriller is #6 in Silva's Gabriel Allon series. I must say that each book so far has been more exciting than the last. Gabriel Allon is an art restorer but that is just his cover. He is a spy and also often an assassin for Israeli intelligence. In The Messenger, the evil entity is al-Qaeda. It appears that the organization is planning a more audacious attack on the Vatican that will top what they did at the World Trade Center. For the first time in the series, that I can recall, Gabriel teams up with the CIA. I read the book right around the time that Jamal Khashoggi was murdered in Saudi Arabia. A certain high-powered Saudi businessman features in the story, so even though it is now 12 years since the book was published reading it was like going behind the news of today. As always, Silva presents his Israeli-centered viewpoint on world events but this time I really felt the series moving towards the present. Glad you are enjoying this series!! Yes, I am as well as learning new things. I, too, am working my way through this series and this book is the next one for me. The books are all well-written, but I confess that I sometimes find what you refer to as the "Israeli-centered viewpoint of world events" a bit off-putting. Middle Eastern politics, it seems to me, is a kaleidoscope in shades of gray, not the black and white world as presented in these thrillers. At least that is true in the ones I've read so far. I agree that Middle Eastern politics in not black and white, if it is even understandable from our part of the world. 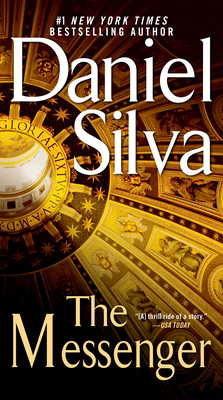 I take what Silva is doing with these thrillers as his attempt to give the Israeli viewpoint. So for me, the books have helped me understand that particular viewpoint better. The best is yet to come. Zizi al-Bakari is the father of Nadia, the woman at the center of Portrait of A Spy--if memory serves me well. His views are not Israeli-centered nor black and white; they are definitely not liberal ideas either. There's more to the point of "getting along with the neighbors" than evening news portray. Oh my goodness, you are making me want to read them all right now! Whoa, I just checked. Portrait of a Spy is #11. Five books ahead of where I am now. Well, I will get there. I should really start this series! This is a series that I have on my TBR and need to get into. Everyone keeps saying how good it is! The series adds important views about Israel to the conversation plus it is as exciting as all get out! The Jamal news was so disturbing. Will it help bring an end to the war in Yemen ? one can only hope with enough pressure. I'm glad you are reading these Silva books. Yes! This whole attitude toward the press is so disturbing. This is an author that I always meant to try but never did. Sounds good. I understand. After all how many series can an avid reader handle? I am glad I started this one though and will not let go.